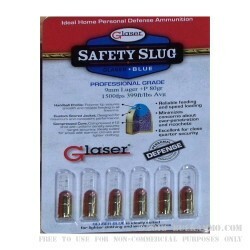 Originally invented as an ammunition for Sky Marshals in 1974, the Glaser Blue Safety Slug is a pre-fragmented projectile that is perfect for home use, or in close quartered self-defense situations. These 9mm +P rounds use a traditional copper jacket with a compressed core of lead shot. This is then capped with a polymer ball, which allows for reliable feeding for when it matters most. In ballistics tests, Glaser Blue achieved penetration of 5 to 7 inches, with fragmentation within the first 2 inches. This allows for penetration through denim and other clothing before maximum expansion and fragmentation. This 9mm +P Glaser Safety Slug ammunition features an 80-grain pre-fragmented hollow-point bullet loaded into a boxer-primed, nickel plated brass casing. These rounds are capable of a muzzle velocity of 1500 FPS and come in a 6 round box. Corbon ammunition has been a family-owned, American business for more than 33 years. Manufacturing quality ammunition for self-defense, law enforcement and hunting applications, they have forged a reputation of quality control and exceptional customer service.